A modern and luxurious resort with a spectacular huge yellow tower-block hotel making up the main one of three base areas. Hot springs and Japan's deepest lake nearby, friendly, modern, great ice cream. When will it snow in Appi Kogen? 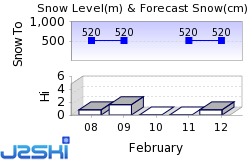 The next notable snow forecast for Appi Kogen is 8cm3in, expected on 26 April, with around 18cm7in forecast over the next 7 days. How High is Appi Kogen? The Japanese Ski Resort of Appi Kogen is one of the larger Ski Resorts in Japan and has direct access to 45km28 miles of downhill skiing, with 39 marked pistes, served by a total of 18 ski lifts. Appi Kogen offers some good boarding and there is a Snow Park in Appi Kogen. When is Appi Kogen open? We don't currently have confirmed season dates for Appi Kogen. Usual opening is early December, and usual closing is Early May. NOTE:- Lift and Piste openings are always subject to Snow Conditions in Appi Kogen. The 18 ski lifts of Appi Kogen are able to uplift 28,136 skiers and snowboarders every hour. Appi Kogen is in Iwate, Japan. Common questions about Appi Kogen. Want to ask about skiing and snowboarding in Appi Kogen? Or contact Appi Kogen Tourist Office. Note :- The information on J2Ski concerning Appi Kogen, where not clearly factual, is opinion only and is neither definitive or exhaustive.